This Error Message Article explains the LABEL MATRIX error message”Unfortunately, the software could not be activated. 288 – This license is not compatible with Virtual Environments.” and details how to fix the underlying problem that caused it to appear. 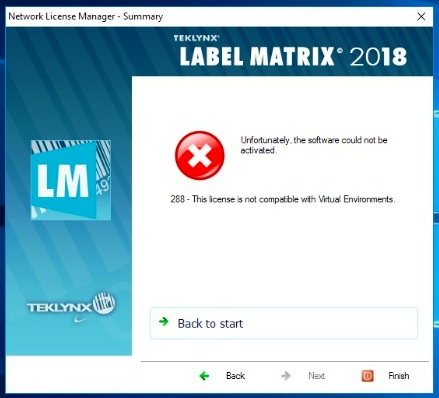 TEKLYNX provides separate licenses for virtual machines and actual computers (i.e. VM and non-VM environments). Therefore, the users must install the correct install file for the environment (i.e. VM or non-VM). When downloading the install file from the TEKLYNX website, the user must take care to select the correct link to download the correct software. In this case, the user attempted to use a license key issued for a standard (i.e. non-VM) network utilities software application to activate the VM network utilities software. To use on a virtual server or virtual PC, please request deactivation of your current license and upgrade to a VM software compatible license. Check the software installed is for a virtual machine. If not, uninstall and reinstall. Then apply the new license key to the network utilities.